A colourful 22 degree icy halo and upper tangent arc surround the low winter sun at 13.00 UT on Jan 16th 2007. 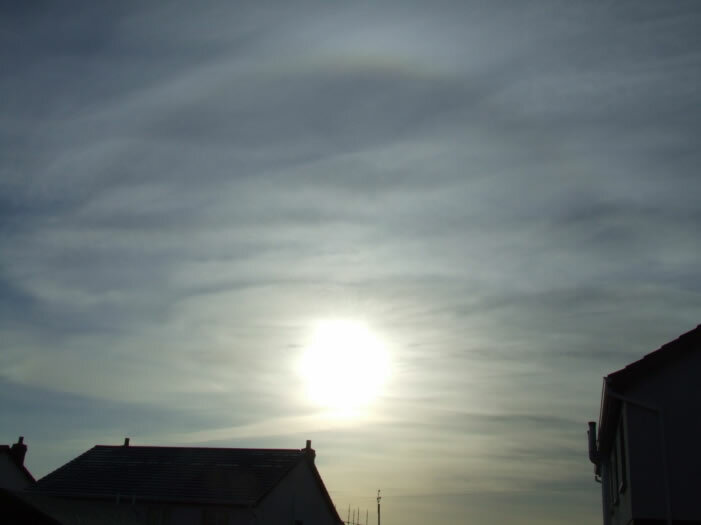 These milky Cirrostratus clouds are perfect for producing atmospheric displays. I took this image after 1.5 hours searching for great comet P1 Mc Naught in daylight where it was only 10 degrees from the sun (near the right chimney pot) however these icy clouds prevented detection. ISO64/ 1000th/sec.